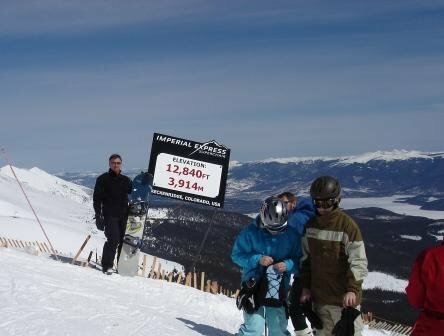 We rode the new Imperial Superchair, now the highest chair lift in Colorado, to an elevation of over 12,800 feet. While temperatures climbed into the 60s in the town of Breckenridge far below, things stayed cold and snow was massive up on top of Peak 8. As I have over the past eight years, I'm boarding again. The snow is as good as I can ever remember for April in Colorado. The vista from this height is incredible. In the distance is frozen Lake Dillon, a major source of water for metro Denver. Generous snow this year bodes well for water supplies and reduces the threat of forest fires.